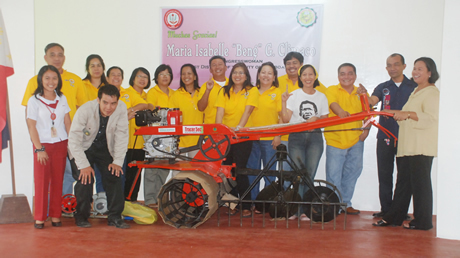 THE College of Agriculture of Western Mindanao State University (WMSU) in a formal turnover ceremony received a donation of one Lupar hand tractor from Congresswoman Ma. Isabelle Climaco-Salazar (Dist. 1, Zamboanga City) last October 8. �This tractor will further equip your college to train young local agriculturists and promote the development of agriculture in the city�, the congresswoman said in her message during the program held at the College�s San Ramon campus. The event was graced by top WMSU officials led by Vice-President for Administration, Planning and Finance Atty. Eduardo Sanson. In her welcome remarks, Agriculture College Dean Dr. Teresita Narvaez warmly thanked the college�s Batch �84 graduates led by Fr. Alain Ruiz for facilitating the donation from Cong. Climaco-Salazar. She noted that having been designated a �National University/College of Agriculture� (NACU) some two months ago by the Commission on Higher Education, such equipment will further strengthen it to deliver its function as a regional resource center for the farming sector. San Miguel Corporation also turned over a power sprayer to the college during the same event. Representatives of Batch �84 led by Fr. Ruiz formally received the donation from the lady solon, then turned it over to the WMSU as well as the college.